Shopping for your wedding dress is for most brides one of the highlights of wedding planning – any one of these fantastic boutiques will work hard to ensure your experience is positive, fun and memorable. Fabulous designers and wonderful accessories combine with unsurpassed levels of knowledge and really excellent levels of customer service to make these stand-out boutiques really very special indeed. Caroline represents the best of couture British design. Her gowns are hand-stitched to perfection and are the ideal choice for those brides who value very fine, high quality craftsmanship. Emmy Scarterfield has an innate eye for style. Her shoes are designed to perfection, making even her highest, most glamorous of heels comfortable to wear for hours. We love that The Wedding Veil Shop offer a truly personal service, with everything handmade from scratch on site. Sanyukta stands out in a crowd of bridal fashion designers for her ethical, fair trade, eco-friendly bridal designs. I really do adore her gowns and she is the most charming individual too. Sassi’s reputation precedes her and she and her team know everything there is to know about fit and fabric. As a result, every Sassi Holford gown is exquisite in the extreme and amazingly flattering. Grace Loves Lace make ethically made unique luxurious gowns that are versatile and comfortable. Perfect for boho chic loving brides. Stewart Parvin is a highly skilled luxury wedding dress designer. His gowns represent the very best of bridal couture and high quality craftsmanship. We are immensely proud to be able to recommend him through our Little Book. Set in the heart of Liverpool City Centre, the award winning team at White Closet Studios offer some of the most sought after designers who create unusual and romantic dresses, including Love My Dress favourites Halfpenny London and Jesus Peiro. Where to start with Kate? She's amazing - a creative force to be reckoned with, bursting with talent, personality and style. I adore her and everything she does. We really love to support this bridal boutique team who are genuinely passionate about providing a great service. The Wild Heart Bridal stock an incredible range of handpicked dresses from some of the most exciting and stylish designers across the globe. The perfect boutique for fashion loving brides. Sian has been an absolute joy to work with so far - she knows how to offer luxury in a completely relaxed and down to earth format. Beautiful award winning bridal boutique in the heart of Yorkshire stocking romantic vintage inspired and bohemian dresses for modern brides. Chloe is passionate about modern, elegant bridal fashion and loves working with brides of all kinds so that they feel their most beautiful on their wedding day. Laura and her team share our taste for beautiful bridalwear and have created a haven of loveliness for brides in the Winchester area. I'm so proud to be supporting Carina's beautiful boutique. This is a team who really know their bridal fashion, stocking a number of my favourite designers. Expect a warm welcome and memorable visit. Miss Bush is a leading British bridal boutique, housed in a converted former chapel. This friendly, knowledgeable team is lead by the charismatic Emma Marshall and stocks luxury brands including Suzanne Neville and Jesus Peiro. Whimsical Bride is a fantastic luxury bridal boutique tucked away in beautiful Melrose in the Scottish borders. A superb option for brides local or near to this area - offering some of our very favourite designer brands. 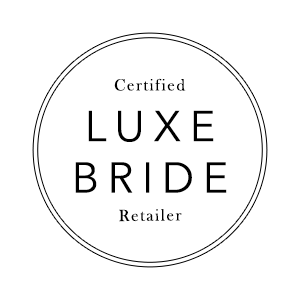 The award winning team at The Bride Boutique are all passionate about working with you individually to make sure that your journey of finding “the dress” is as special as possible. We have a lot of love for the Agapé ladies - they are genuinely lovely people, it's no wonder they have so many satisfied clients. Check out their in-house collection of bridesmaids gowns. Impressive ethical credentials that come from the heart and are 100% authentic. We adore the ethos and ethical commitment behind this brand. MiliMili Bridal stock the highest quality designers who use the finest silks, laces and beading. Perfect for modern style loving brides who want their wedding dress to be as unique as they are. 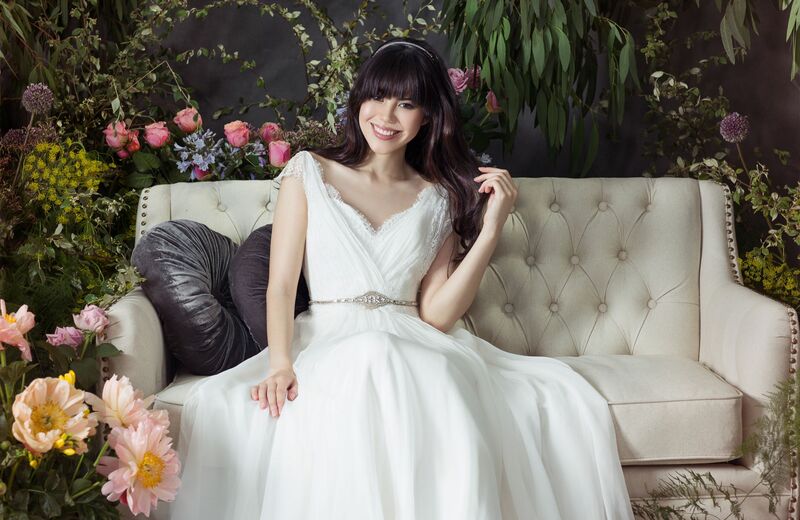 Lyn Ashworth England gowns are the epitome of bridal romance and elegance. These are exquisitely constructed gowns that both fit and move beautifully. Sheffield's leading and most beautiful bridal wear boutique with an outstanding reputation for excellent service, styling expertise and unique gowns from some of our favourite designers. We adore Sally of White Bride - one of those individuals you know within seconds that you can relax and be yourself around. Sally has a real eye for bridal fashion and detail and we love her designer choices. A luxury boutique for the modern bride. Remember, luxury isn't what you can afford, it's all about the experience you receive. Kerri delivers a high end experience with passion and vast expertise. Maria and her team are warm, honest, passionate and experienced and will work with you to find the perfect dress which recognises the true vision of your bridal style and wedding day. I'm really proud to be supporting Hayley and her business. She is one of those hard working, determined and passionate business women who always puts her customers first. Emma and her team offer an exceptional experience for brides and some of the finest couture gowns out there. A warm, friendly and spacious boutique waiting to welcome you. We absolutely love to support independent designers - Mette Baillie of the Edinburgh based ‘Freja’ label is one of the most talented. Her Laura and Audrey gowns are our favourite. We love Clare's couture pieces which reflect timeless vintage glamour with a contemporary edge, perfect for the modern bride. A fun and relaxed Surrey bridal boutique with a beautiful rustic vintage French boudoir feel and an incredible range of 'must try' dresses. Mirror Mirror Couture offers a fantastic mix of bespoke designs, a couture service and a carefully curated selection of wonderful gowns from the best international bridal designers. A memorable, personal shopping experience from this family based Kettering Bridal Boutique in a quirky Victorian townhouse in the midlands. Look out for the fabulous catwalk area! Kerensa and her team stock some of our very favourite British couture bridal fashion designers, including Lyn Ashworth by Sarah Barrett gowns and Harriet Wilde shoes. We are incredibly proud to support the most luxurious bridal boutiques in the UK. Eleganza Sposa is a leader in bridal luxury in Scotland. Your first port of call for a truly special gown. Exquisite vintage gowns with exquisite silk bias cut designs dating from the 1930's through to floaty, flower-power, bohemian beauties of the 70's. An absolute must-look if you're into originals. What a pleasure to support such a beautiful, well run boutique, supplying bridal gowns from some of our absolute favourite designers. A wonderful team who will look after you from start to finish. Elizabeth is arguably the most sought after vintage wedding dress supplier in the UK. She travels far and wide to source her gowns, lovingly restoring every one of her fabulous finds. A truly fabulous collection of gowns from our absolute faves, including Jenny Packham, Caroline Castigliano, Jesus Peiro and Temperley. Natalie and Anna offer an exceptional service.